Driven by demand and nurtured in the diverse terrain, Southern Oregon’s wine industry begins to come of age. Talent’s industrial strip along Highway 99 is lined with storage warehouses, auto body shops and junk stores. But turn down Rapp Lane and you’ll quickly find yourself on some of Southern Oregon’s most beautiful and verdant back roads, driving past white goats and a piebald horse munching dry grass and several black cows staring blankly at green hills dotted with snow. 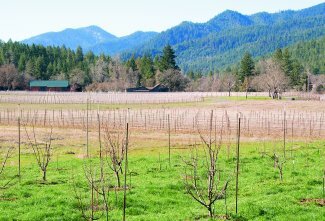 With an extended growing season, warm weather and fertile soil, this countryside between two of the region’s fastest-growing cities, Ashland and Medford, long has been celebrated as a fruit-growing region. The first pear trees were planted in the late 19th century and dozens of eager business pioneers from the East Coast and the Midwest rushed to Oregon to buy land. But in the past 10 years there has been an enormous shift from planting fruit trees to planting higher-value grape vines. With that has come an explosion of new wineries, with more than half a dozen new vineyards planted this year alone. Currently 60 vineyards in Southern Oregon hold winery licenses. 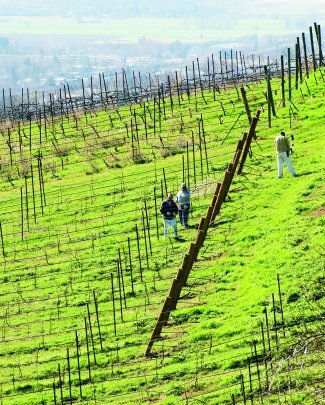 “When we planted our grapes in 1990, there were six wineries and about 350 acres of grapes in the Rogue Appellation,” says Laura Lotspeich, whose winery, Trium, is located at the top of the hill on Rapp Lane. 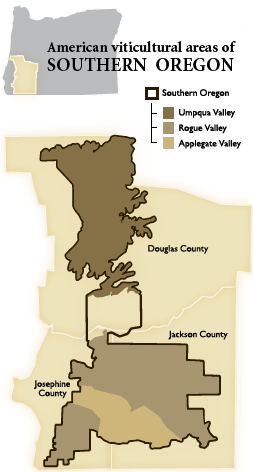 The Rogue Appellation extends from the California border north to Grants Pass and includes the Applegate Valley, the Illinois Valley, the Rogue River Valley, and the Bear Creek Valley. Today there are 67 wineries and over 3,000 acres of grapes planted. “Much of that growth has happened in the past five to 10 years,” says Lotspeich. The economic impact on the region is twofold: in addition to creating new jobs, these wineries are adding to the already well-established tourism industry in the area. Tourism in the region historically has been from the arts (the Britt Festival in Jacksonville and the Oregon Shakespeare Festival in Ashland) and from outdoor recreation. But now the area’s wine industry is drawing tourists. 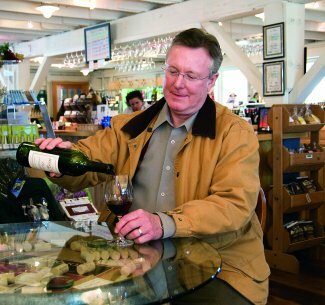 Winery manager Michael Donovan in the tasting room. 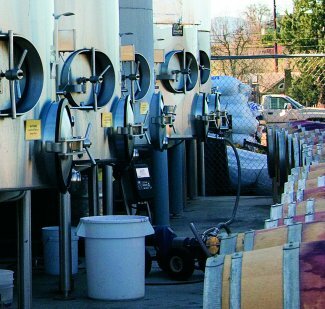 The RoxyAnn Winery and Hillcrest Vineyard in Medford produce a wide range of wines. 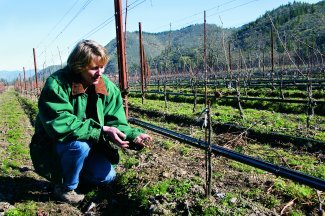 When Laura Lotspeich, 55, and her husband Kurt moved in 1990 to Talent from Conifer, Colo., to plant their first grape vines, they were among only a handful of growers in the region. Lotspeich, who has a degree in interior design and has spent most of her career managing specialty design shops, says they made some basic mistakes at first. Since the wine scene in Southern Oregon was so new, they had to learn as they went. They planted a variety of Chardonnay grape, which did not grow well on their site, and ended up ripping out 750 vines. But they kept meticulous records, shared the results of their failures and successes with other growers in the area, and learned quickly from the mistakes. Soon they were selling their grapes to wine makers. Though Lotspeich says with a laugh that the adage in the industry is to “keep your day job,” within five years they started seeing a positive cash flow. In 2008, about 50% of the grapes grown on the Lotspeichs’ 18.5 acres were trucked north to wineries outside of the Rogue Appellation. 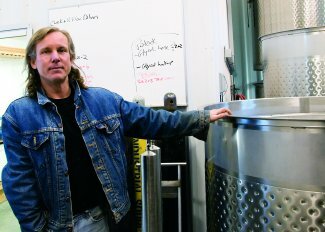 Because of the geographic diversity of the region, many varietals that cannot be grown in the Willamette Valley flourish in the south, and the quality of the grapes coming from Southern Oregon has continued to improve as growers and wine makers, like Lotspeich, gain experience in the region. While the Willamette Valley’s Pinot Noir has been the most celebrated wine in Oregon, the high-quality grapes from the southern region have helped the state establish a reputation for other wines. The terrain and weather patterns in Southern Oregon are so diverse that the microclimates in this region support a variety of different grapes. The Bear Creek part of the Rogue Valley, where Trium is located, has made its name growing very ripe, quality grapes for Merlot, Cabernet Sauvignon and Cabernet Franc. Seeing a demand for high-end wine, the Lotspeichs went into partnership with two other couples. In 2005, after 15 years of growing grapes for other wineries, the first vintage (a 2003 Growers’ Cuvée), under the label Trium, hit the market. Since then, the wine side of their business has been steadily growing: They’ve seen a big jump in the number of visitors to their tasting room and last year harvested 57 tons of grapes, using nine tons to make Trium wines. (center) started selling wines from their organic vineyard (bottom) in 2006. Winemakers and grape growers in Southern Oregon agree that one of the main reasons for the recent success of wines in the region is the spirit of cooperation among people in the industry. “I’ve been absolutely dumbfounded by the camaraderie and support that all the grape growers and the wineries in this area provide to each other,” says Emily Mostue, co-owner of Rocky Knoll Vineyard in Medford. Since the majority of the labels from Southern Oregon are from small vineyards that farm only between five and 10 acres, wines from the area cost more than wines from California, New Zealand, Australia and other regions that have such large-scale production. The average price of a bottle of red wine produced in Southern Oregon is between $16 and $20, which makes it a luxury product to many buyers, especially now. As the economy pinches far-flung travel budgets, more visitors from Portland and Seattle have been coming to check out the wine scene in Southern Oregon. “It’s a bit like touring the world,” says Lotspeich. “We have some German wines, French wines, Spanish wines, and Syrah, so you don’t have to go to Australia, France, Germany and Spain to try them.” This year Trium’s tasting room will be open longer hours than ever before. She can’t know for sure, but Lotspeich thinks she’ll see a large number of customers visiting on Mondays, when the Oregon Shakespeare Festival in Ashland is dark. Still, it’s an uphill battle for Southern Oregon to gain national attention as a wine- growing region, sandwiched as it is between California—which produces 95% of the country’s wine—and northern Oregon and Washington State, which are much more established wine regions.